Welding is an absolutely popular and rewarding career. There are lots of people in the USA who want to start their training as a welder. 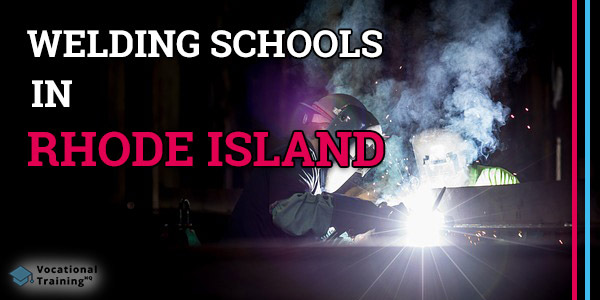 If you are looking for some welding schools in Rhode Island, this article is for you. We’ve prepared the list of welding schools in the state as well as some useful tips for future welders. In case, you are thinking about becoming a welder in Rhode Island, you need to learn some important aspects. Rhode Island has 3 welding certification schools in total. It can be not so many but still, you have options to choose from. Just carefully learn about all the available options and make the final choice that suits your needs most. Fab Tek Technology is in the list of the best welding certification schools in Rhode Island. It is located in Hope Valley. There are three SENSE levels from the American Welding Association in total. They are Entry Level, Advanced Welder, and Expert Level. Fab Tek Technology provides Entry and Advanced level training programs. Nationwide Diesel Technology is also in the list of the best welding certification schools in Rhode Island. It offers a welding training program that provides knowledge of all the necessary methods and basics. If you want to get more info about the program, you need to visit the AWS Welding School Locator page for this school. The New England Institute of Technology provides about 50 various educational programs and welding is among the list. There are both Associate’s and Bachelor’s degrees. Completing its welding program you’ll be able to apply for a variety of welding jobs such as Aluminum Welder or Sub Arc Operator. Visit the Welding Program Overview page to get more info about the educational program. Also, there are such programs as Mechanical Engineering, Heating & Plumbing Technology, and Advanced Manufacturing Technology. Below, you can find the list of the best welding schools in Rhode Island including their contact info. Becoming a welder in Rhode Island, you can get a rather high salary. Here you can find some data about welder’s salary in Rhode Island and its comparison with national rates. A median salary of a welder in Rhode Island is about $42 410 per year or $20.39 per hour. A median average salary throughout the country is of $39,390 annually which is $18.94 per hour. Speaking of the top 10% of welders, in Rhode Island they earn about $58 780 per year. Nationally they earn about $62 100 annually. Welding is an absolutely rewarding and meaningful career. If you’ve decided to become a welder, it’s absolutely a good choice. You just need to decide on a welding school where you can get your training. We hope, this article will help you to make your mind and take the right decision.